United's Kane Crossley loops one over Louis Taylor. Skegness United thrashed Old Doningtonians 10-0, giving their promotion push a huge boost. There are four teams still in with a chance of the two promotion places in the Boston Saturday league’s Workforce Unlimited Division One, ahead of the final round of matches on Saturday. Kirton Town currently lead the table on 39 points with a goal difference of 30, followed by United on 37 points (31). Boston College are third 0n 37 (25) and Horncastle Town Reserves are fourth on 36 (26). Although Kirton lead the table they could still lose out when they visit Woodhall Spa United, who beat Kirton them three weeks ago in the Challenge Cup final. United travel to Friskney, whose promotion hopes were ended on Saturday as they lost 3-2 at at Woodhall. 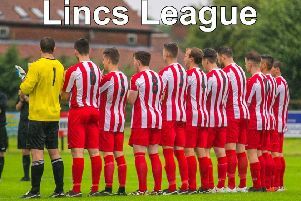 Horncastle travel to Old Doningtonians and Boston College are at home to bottom club Freiston. United had to make chances to the starting line-up on Saturday, Nathan Wetton, Kane Crossley, Jake Woodhouse and Ben Drysdale coming in. From the start United had complete control of the match and once the first goal came from Anthony Miller more followed at regular intervals in the first half from Jake Woodhouse, Ben Drysdale and Kane Crossley. The nearest the visitors came to a goal was after 25 minutes when they broke down their left and, when the shot came in, it just missed the far post before being cleared. Second half goals came from Zak Bray (two), Jake Woodhouse, Ben Drysdale and Keaton Grainger (two, including one penalty). UNITED: J. Minor, Bray, Kendrick (Sleight), Gray, Wetton, C. Minor, Woodhouse, Kane Crossley, Miller, Drysdale, Grainger. Man of the match: Jake Woodhouse. On Saturday United travel to Friskney (KO 2.30pm).